Phil sent out a message. 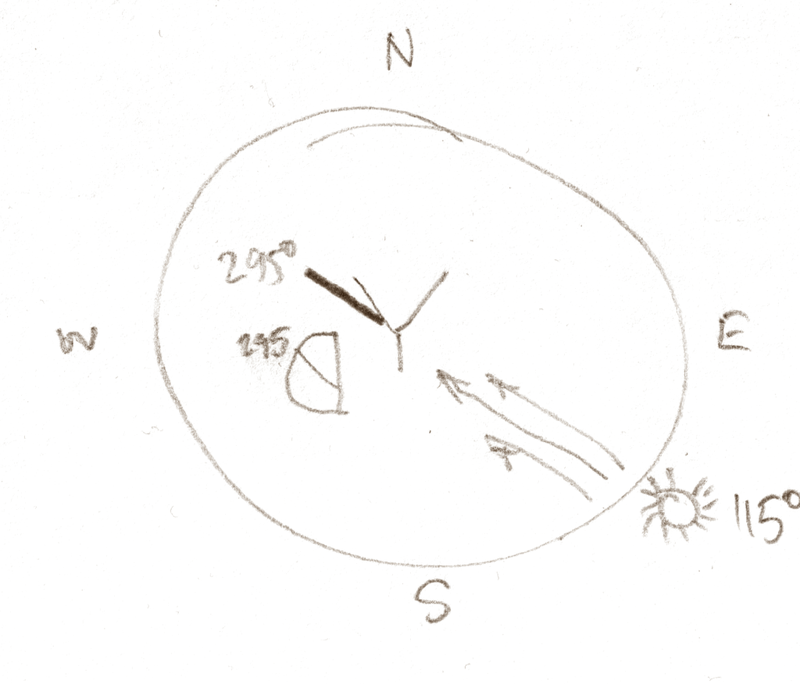 He included a note received from iOptron on how to polar align a mount in the daytime. This would prove handy during a solar eclipse. But I read the instructions over and over, unable to fathom the approach. First level the mount with a bubble level, then set the polar axis scale on your mount to the latitude of your observing sight [sic erat scriptum]. Now you hang a weighted string from the center of the base of your tripods/mount. Take a protractor and place it on the ground under the center of your weighted string, rotate the protractor until the strings shadow lies on the known azimuth +180 degrees. Now simply rotate your mount until the polar axis is directly above zero on the protractor. Confused, I searched Google for instructions. Found the Sky and Telescope article clear. Saw what was tripping me up. The sentence ending, "rotate the protractor until the strings shadow lies on the known azimuth +180 degrees" is actually a mathematical formula. Maybe it should say "rotate the protractor until the strings shadow lies on the known azimuth +180 degrees" or "rotate the protractor until the strings shadow lies the total of the known azimuth plus 180." When I got out a scrap of paper and sketched it, it made perfect sense. So, as usual, I want to rewrite these instructions. 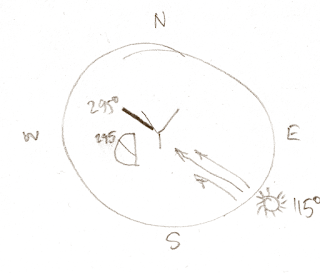 Finding the North Celestial Pole (NCP) in the day time. Set mount altitude scale to the latitude of observing site. Hang a weighted string from centre of base of mount. Place protractor on ground under centre of weight. Determine azimuth of Sun (in software, if possible). e.g. 115°. Add 180 to value. e.g. 295°. Rotate protractor until string shadow lies on total value. Rotate mount in azimuth until polar axis is aimed to 0/360° on protractor. I guess I'll pack the protractor. All the while, I kept thinking about simply using a compass! Although one must know the magnetic declination... I crunched the numbers for our planned location. Declination should be around 8° 30' east. I guess I'll pack the compass too.